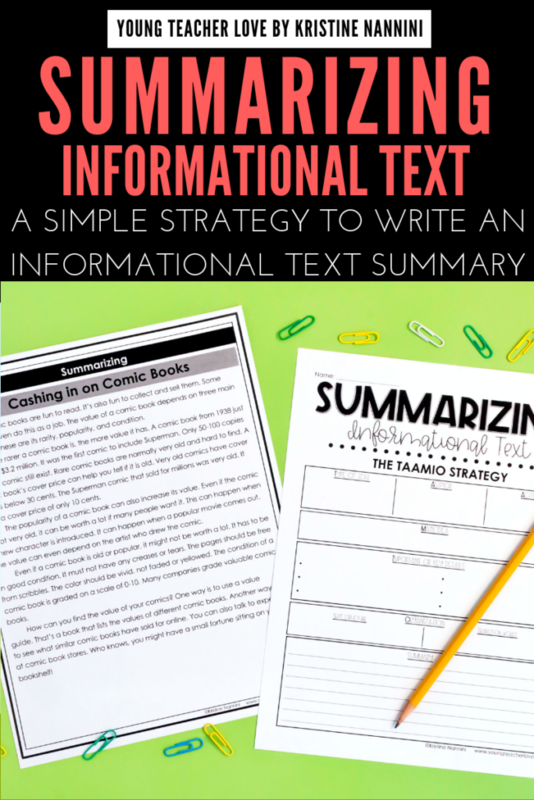 Summarizing informational text has several uses for students. It teaches them to determine the most important ideas in a text, ignore unimportant information, and connect the main idea and key details of a text in a logical way. Summarizing also helps improve memory and comprehension of a text because students are required to focus on only the most important points. 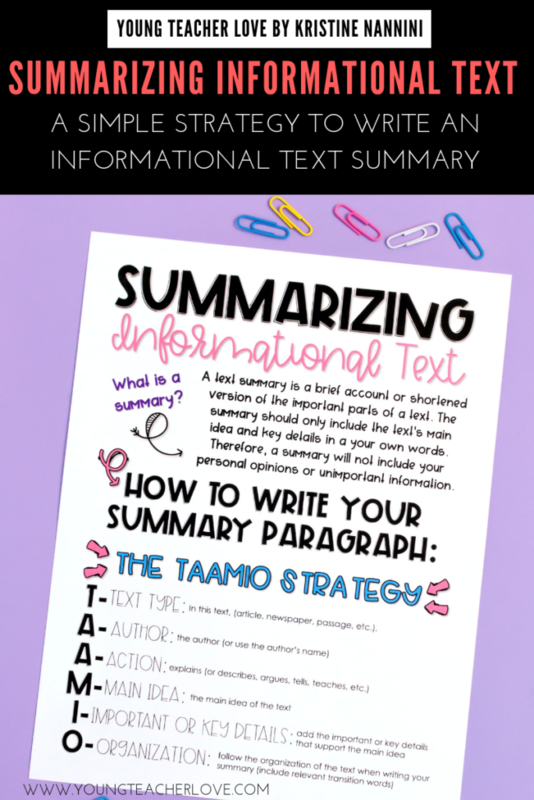 A text summary is a brief account or shortened version of the important parts of a text. In an informational text, the summary should only include the text’s main idea and key details in a student’s own words. Therefore, a summary will not include a student’s personal opinions or unimportant information. 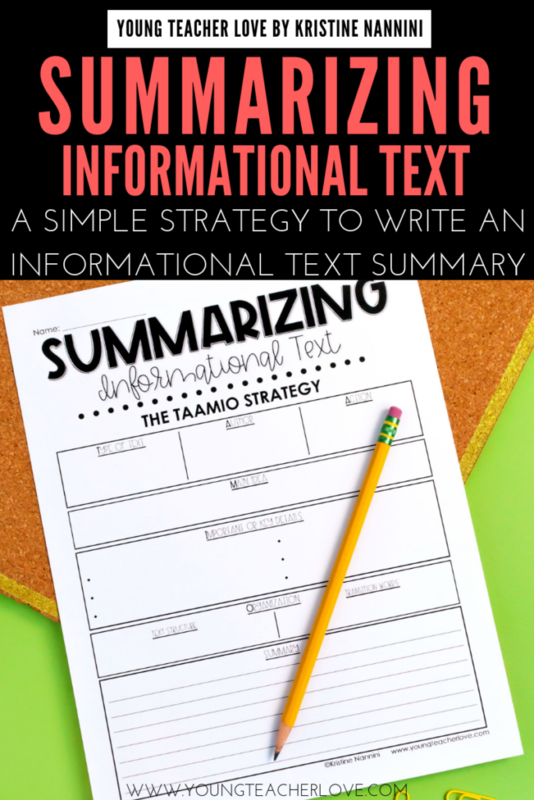 The strategy below will help you simply and easily teach summarizing informational text. 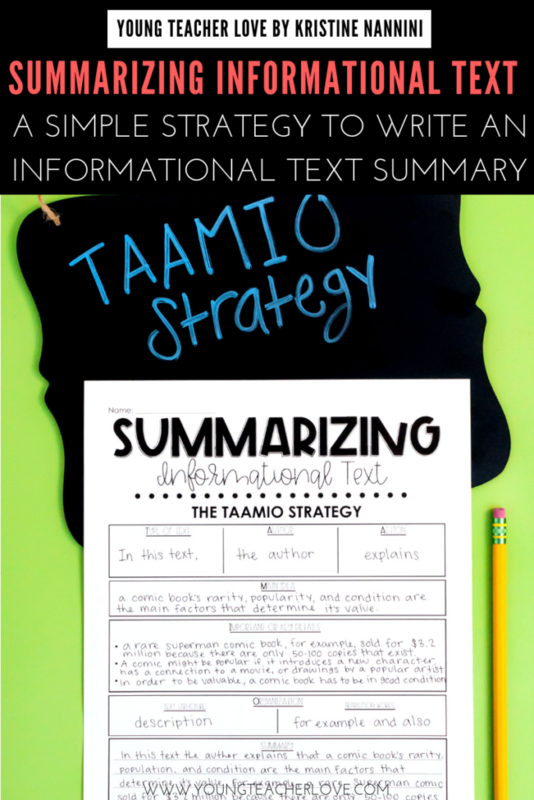 I included this free poster and a free graphic organizer for students to organize each part of the TAAMIO strategy that will make up their final summary. In order to get students to successfully write each part of TAAMIO, there are a few things you should work on with students. I call this the planning stage of writing a summary. Use the graphic organizer included in this freebie to guide your students. For the purpose of this blog post, I used a passage from my Summarizing Differentiated Passages and Questions found HERE. This passage is titled, Cashing in on Comic Books. 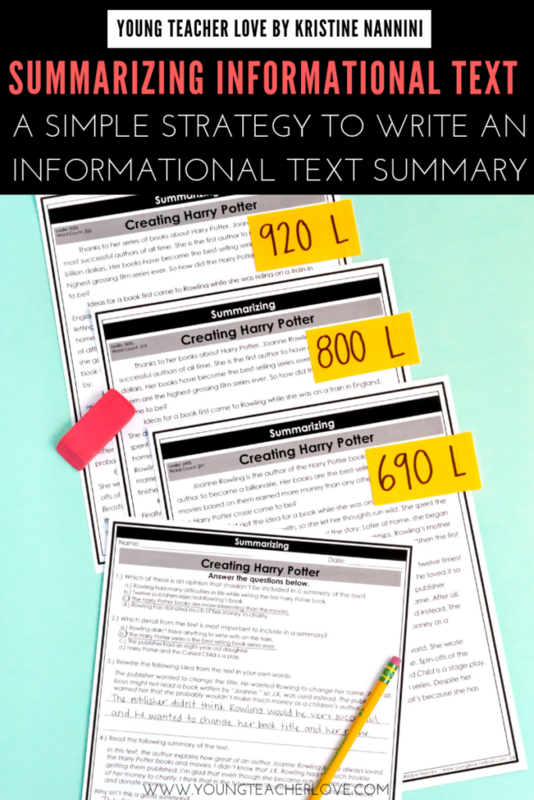 You can hand out a copy of the text to each student to work together with them whole group. Remember, these passages are differentiated, so you can even do this work in small groups ahead of time, then come back together to write the summary together as a class. Or, you can blow this text up to work together with your students using the shared reading strategy. 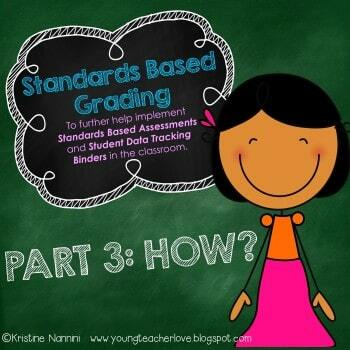 To begin with, the T, A, and A should be fairly simple and straightforward for students. They simply identify the text type, the author, and an action word to begin the first sentence of their summary. As students continue practicing this, they will begin to do it automatically. Next, students will work to write the “meat” of the summary (the M, I, and the O). 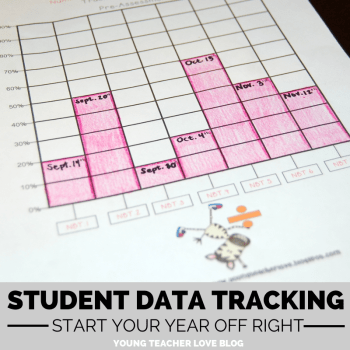 Read on to see how I break down each step for students. The next step is to determine the main idea. The main idea is what the text is mostly about. 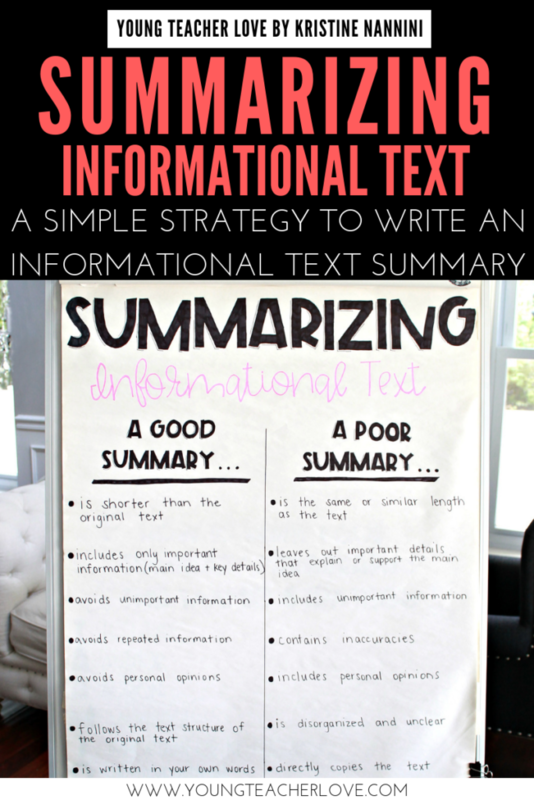 To write an effective summary, your students must be able to determine a main idea as a starting point (which is why I teach this skill before summarizing). You can check out my Main Idea and Key Details Differentiated Passages and Questions HERE. If your students need additional help to determine the main idea, you can use the questions below to start a discussion with your students. While reading the text, work together with your students to answer the questions below. Look at this first paragraph of the text. What topic is the author introducing or explaining? What is the author saying about the topic? Does the author explicitly state the main idea in the first sentence? Does the author explicitly state the main idea in the last sentence? Does the author explicitly state the main idea anywhere in this paragraph? What is the author saying to summarize or conclude the text? What is a common topic discussed in each paragraph? What is the author saying about that topic? What is one sentence that describes what the author wants you to learn while reading about the topic? These questions above will help guide your students to determine the main idea of the entire text. In the passage, Cashing in on Comic Books, the main idea is that a comic book’s rarity, popularity, and condition are the main factors that determine its value. In the text, the author explains a comic book’s rarity, popularity, and condition are the main factors that determine its value. 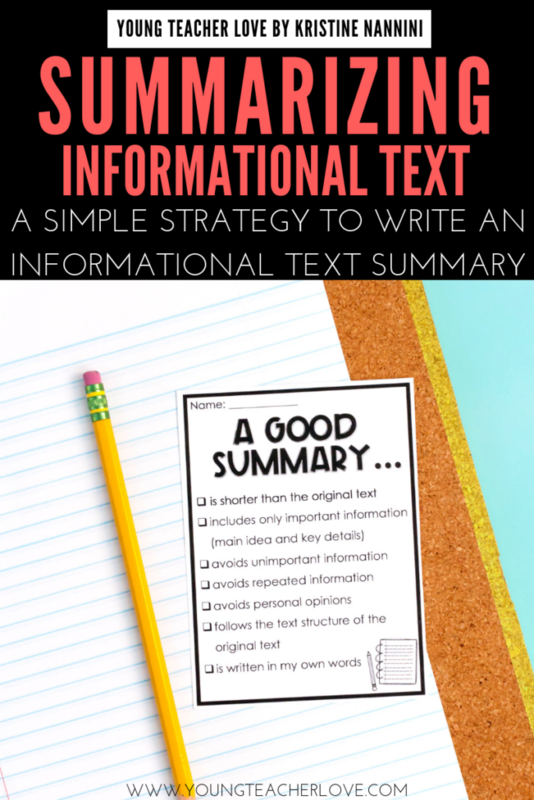 The next step when teaching your students to write an informational text summary is teaching them about important or key details. This step is the I in TAAMIO. Key details are any facts, examples, reasons, or information that support or explain a main idea. It’s important that students understand that within a text, there will also be unimportant details. Many students tend to include unimportant details in a summary, so it is important that you teach the difference between key details and unimportant details. Once your students have a firm understanding of what key details are, teach them about unimportant details. Unimportant details are any details or ideas from the text that aren’t necessary to help a reader understand the main idea. Let’s look at a paragraph from our original text to practice. Again, since this may be a tough concept for students to understand, you may want to do a shared reading. You can either blow the text up as a large poster or project it on your board. Work together with students to identify the key details vs. unimportant details from the text. 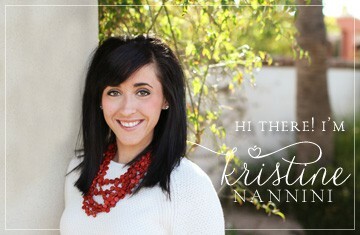 Highlight the key details in one color and the unimportant details in another color. For this text, key details are highlighted in green, and unimportant details are highlighted in blue. MAIN IDEA: A comic book’s rarity, popularity, and condition are the main factors that determine its value. As you are going through each sentence in this paragraph, keep repeating this question: Does this detail help a reader understand the main idea? While some students may understand this right away, others may need additional help and reinforcement. Remember, you must do this for the entire text. Start by doing one or two paragraphs with your students, then gradually release responsibility to them to finish the text. As you go through the entire text, you should work with students to narrow down the important details that support the main idea. Before going to your graphic organizer to write the important details, you first must talk to your students about the points outlined below. Since summaries should only include the key details in a text, students should omit their own personal opinions or views about the text. Students can get practice with this in my Summarizing Informational Text Differentiated Passages and Questions HERE. 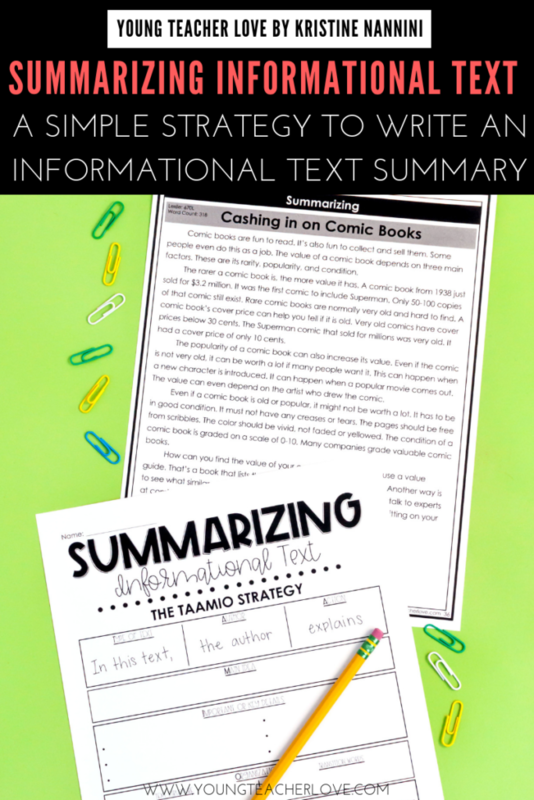 In this resource, I provide students with the opportunity to read completed summaries and identify those that contain personal opinions. It’s important that you provide students with the opportunity to practice this skill so that they understand when they do it. When students are summarizing, they should not copy the text. Instead, they need to paraphrase. In addition, they should try, when possible, to condense several key details into a single, concise sentence. Explain to students that they need to put each key detail in their own words and combine any key details that are related. It is important that you practice paraphrasing with your students so that they feel confident doing this when writing a summary. 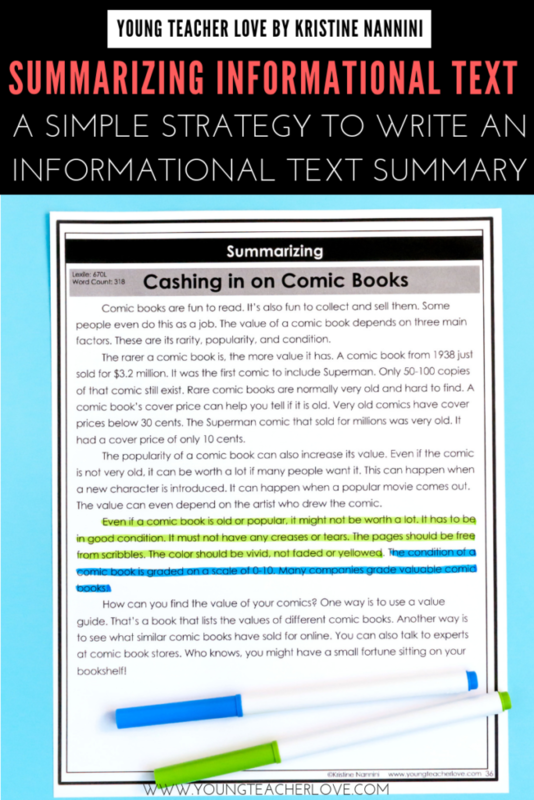 Use the same passage, Cashing in on Comic Books, from my Summarizing Informational Text Differentiated Passage and Questions to practice paraphrasing key details. 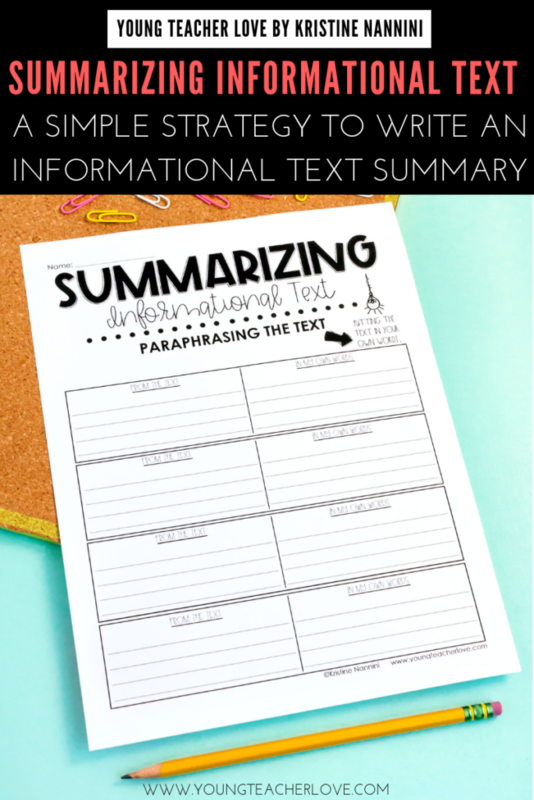 I created this simple graphic organizer to help students with paraphrasing. I recommend printing this paraphrasing organizer on the back of the TAAMIO graphic organizer. That way, students can flip back and forth to each page as they are putting together the pieces of their summary. Below is an example from Cashing in on Comic Books. Important details from the text: Even if a comic book is old and popular, it won’t be worth much if it isn’t in good condition. In order to keep it’s value, a comic book must not have any creases or tears. The pages should be free from scribbles, and the color should be vivid, not faded or yellowed. Paraphrased: In order to be valuable, a comic book also has to be in good condition meaning it should be free from creases, scribbles, or tears and have vivid color. *This paraphrased sentence is now ready to be used as an important or key detail in our final summary. Continue to do this for the entire passage. You can break it down paragraph by paragraph for students so that they understand the concept. 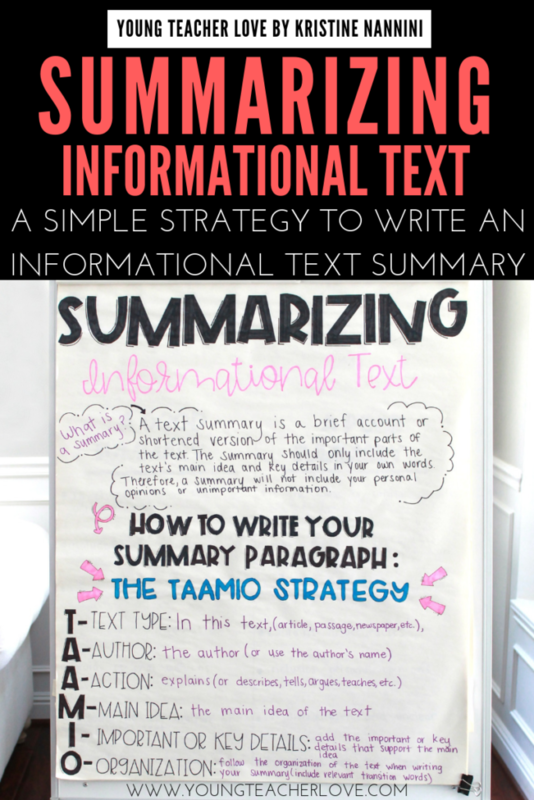 After students have identified and paraphrased the important or key details that support the main idea, they now have the I completed in TAAMIO. 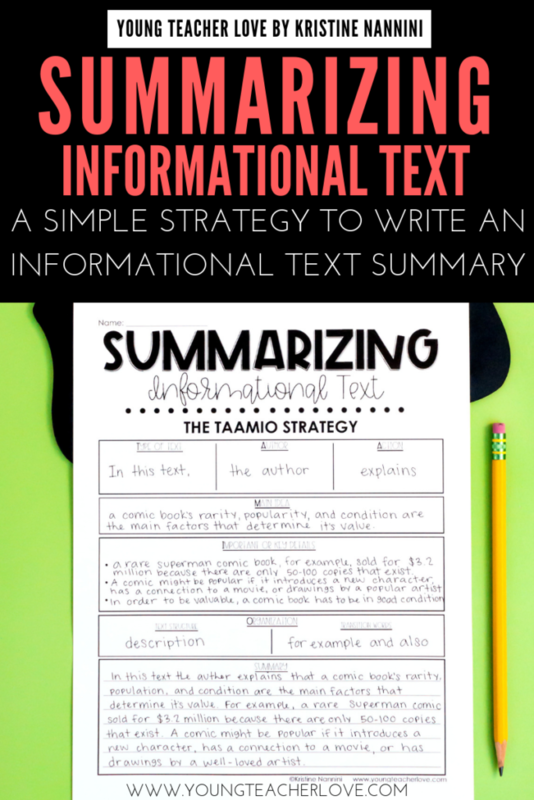 Students should understand that the text structure of a text will help them organize their summary. A summary should be organized using the same structure as the original piece. For example, if the text has a sequence text structure, the summary should state the main idea and present the key details in chronological order. Also, students should use transition words in their summaries that help readers understand how the events are connected or related. Our original passage, Cashing in on Comic Books, uses a description text structure. Description passages often use examples or descriptive words to explain a topic, concept, or idea. Description passages often use transition words like: for example, another reason, also, etc. Students should use similar transition words as the original text to help connect the important details of their summary. You can see in the picture below that there is space on the graphic organizer for students to identify the text structure and to write any necessary transition words. If your students need additional help practicing text structure, you can check out my Text Structure Differentiated Passages and Questions (coming soon…). 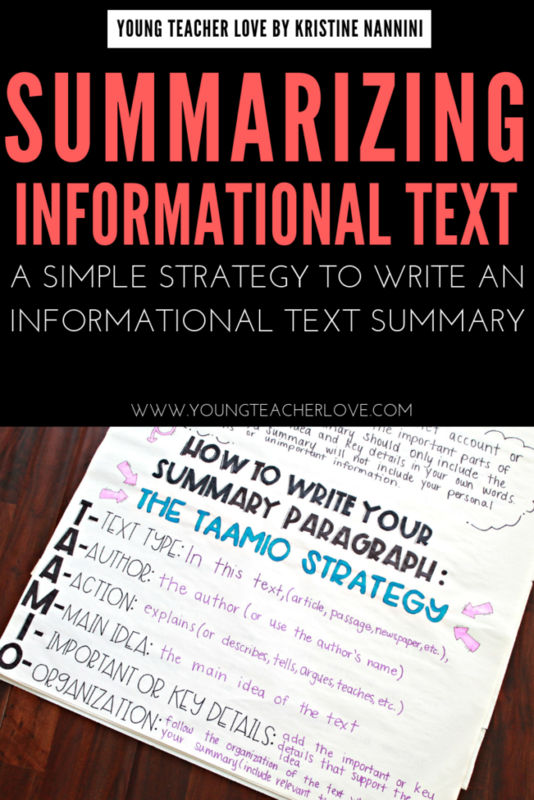 Now that students have completed each part of TAAMIO, they can write their summary. In this text (T), the author (A) explains (A) that a comic book’s rarity, population, and condition are the main factors that determine its value (M). For example (O), a rare Superman comic sold for $3.2 million because there are only 50-100 copes that exist (I). A comic might be popular if it introduces a new character, has a connection to a movie, or has drawings by a well-loved artist (I). In order to be valuable, a comic book also (O) has to be in good condition meaning it should be free from creases, scribbles, or tears and have vivid color (I). 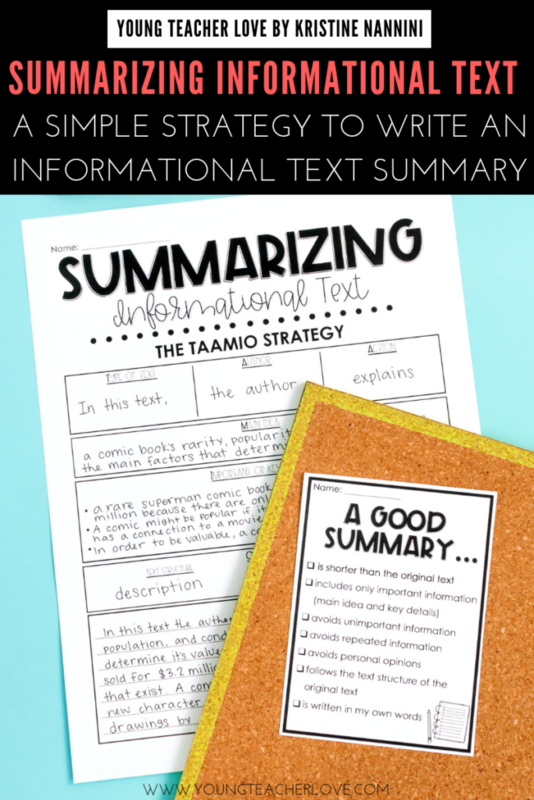 While helping students put together all the steps to write their summary, make sure you emphasize what makes a good summary. You can refer to the anchor chart below to help teach this concept. 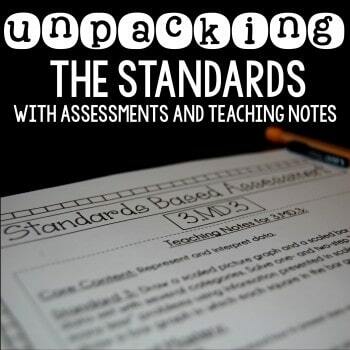 Once students feel comfortable and are ready to practice on their own, you can pass out the checklists for students to use to check their own summaries. These checklists are found in my freebie found here. Now that students understand each step of writing an informational text summary, you have to let students practice this skill. The more students practice, the better they will get at writing informational text summaries. 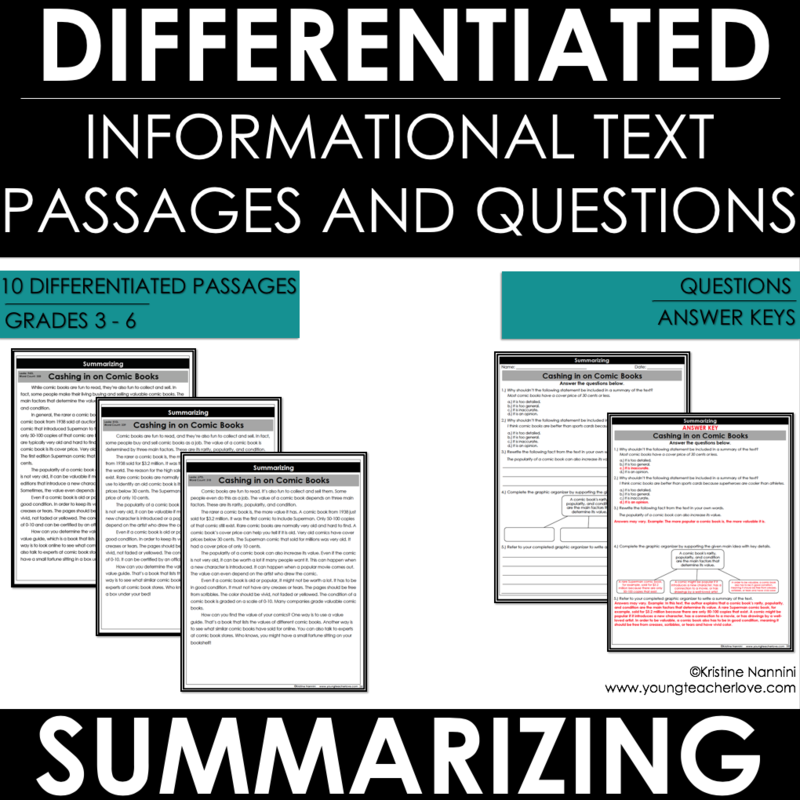 Click HERE or the button below to check out my Summarizing Informational Text Differentiated Passages and Questions.